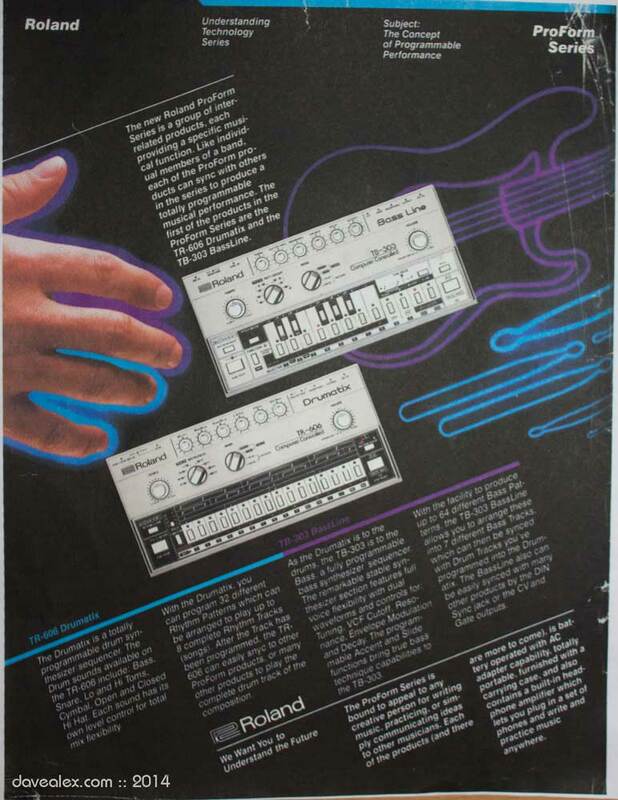 Was doing some cleaning and found this ad from an old Roland Users Group brochure. I had no clue these were from the ProForm Series of musical instruments. What is lost with time…they don’t talk about what the TR and TB stand for… Transistor Rhythm and Transistor Bassline. Everything is COMPUTER CONTROLLED ! I love the tagline at the end… Roland :: We Want You To Understand The Future. I guess they hit that nail directly on the head! The new Roland ProForm Series is a group of interrelated products, each providing a specific musical function. Like individual members of a band, each of the ProForm products can sync with others in the series to produce a totally programmable musical performance. The first of the products in the ProForm Series are the TR-606 Drumatix and the TB-303 Bassline. The Drumatix is a totally programmable drum synthesizer sequencer. The Drum sounds available on the TR-606 include: Bass, Snare, Lo and Hi Toms, Cymbal, Open and Closed Hi Hat. Each sound has its own level control for total mix flexibility. With the Drumatix, you can program 32 different Rhythm Patterns which can be arranged to play up to 8 complete Rhythm Tracks (songs). After the Track has been programmed, the TR-606 can easily sync to other ProForm products, or many other products to play the complete drum track of the composition. As the Drumatix is to the drums, the TB-303 is to the Bass, a fully programmable bass synthesizer sequencer. The remarkable stable synthesizer section features full voice flexibility with dual waveforms and controls for Tuning, VCF Cutoff, Resonance, Envelope Modulation and Decay. The programmable Accent and Slide functions bring true bass technique capabilities to the TB-303. With the facility to produce up to 64 different Bass Patterns, the TB_303 BassLine allows you to arrange these into 7 different Bass Tracks, which can then be synced with Drum Tracks you’ve programmed into the Drumatix. The BassLine also can be easily synced with many other products by the DIN Sync jack or the CV and Gate outputs. The ProForm Series is bound to appeal to any creative person for writing music, practicing, or simply communicating ideas to other musicians. Each of the products (and their are more to come), is battery operated with AC adapter capability, totally portable, furnished with a carrying case, and also contains a built-in headphone amplifier which lets you plug in a set of phones and write and practice music anywhere.